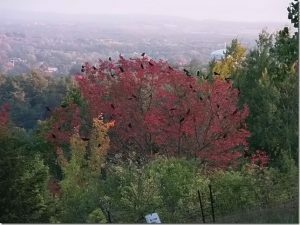 For many years the city American Crows roosted near the Kawartha Golf and Country Club grounds. Recently I noticed a lot of crow calling (before the sun is up) coming from the north of my location at Fairbairn and Raymond Streets. This morning I stepped out my front door at 6:30AM to see and hear groups of crows flying overhead to return to their territories. It sounds like hundreds of crows. I suspect the new roost is in the area of Sobeys on Chemong Road. I will check the Hillview and Daniel St areas. The roost might be near the Towerhill water tower and cell tower. How exciting!! 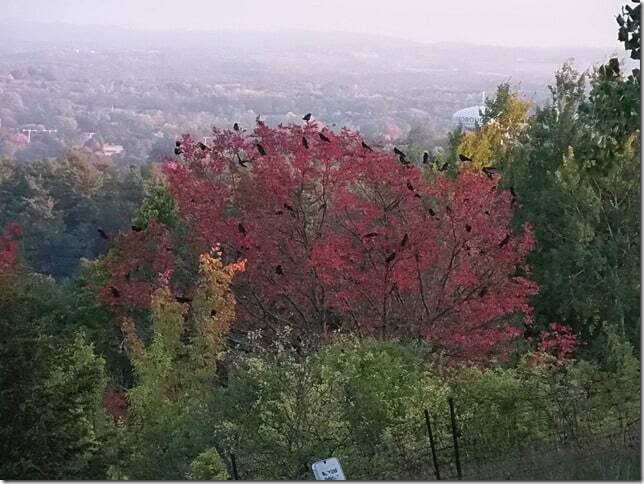 There is in fact a crow roost on the Towerhill Rd hill. The best access is from the back parking lot at the Northview church. It’s quite a sight…hundreds of crows. I saw them doing their social fly around….awesome!! These are just a few of the crows in the picture I sent. They spotted me and took off to various trees to observe. Time was 6:30 PM Oct 4.